The Global Volcanism Program has no activity reports for Koshelev. The Global Volcanism Program has no Weekly Reports available for Koshelev. The Global Volcanism Program has no Bulletin Reports available for Koshelev. Koshelev is at the southern end of the Kamchatka Peninsula, SW of the Pauzhetka volcano-tectonic depression and NW of Kambalny volcano. It is a complex group of four stratovolcanoes constructed along an E-W line over a Pleistocene shield volcano. Central Koshelev stratovolcano, the highest peak of the volcanic massif, is Holocene in age; N- and SE-flank craters have also been active during the Holocene. Gorely, a Holocene cinder cone related to regional basaltic monogenetic volcanicm, is located about 12 km NW. The largest Holocene eruption took place from the eastern cone about 6,500 years ago. An explosive eruption was reported at the end of the 17th century. Major thermal fields are located in the summit crater of Valentin volcano and on the western flanks of west Koshelev volcano. There is no Deformation History data available for Koshelev. There is no Emissions History data available for Koshelev. The compound 2156-m-high Kambalny (left center) and 1812-m-high Koshelev (far right) stratovolcanoes rise SW above the azure waters of Kurile Lake caldera, one of the scenic highlights of the Kamchatka Peninsula. Kambalny is the southernmost large stratovolcano on Kamchatka and Koshelev is its southernmost historically active volcano. Both volcanoes have produced late-stage, very recent lava flows from flank vents on complex older structures. 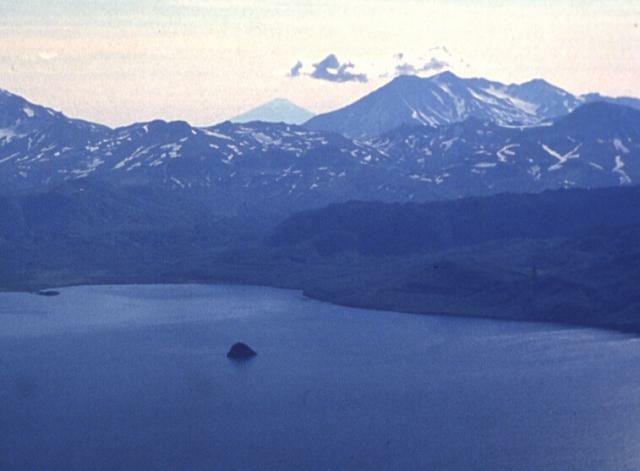 The small island in Kurile Lake caldera is the "Heart of Alaid," a rhyolitic lava dome. Photo by Nikolai Smelov, 1980 (courtesy of Vera Ponomareva, Inst. Volcanic Geology & Geochemistry, Petropavlovsk). 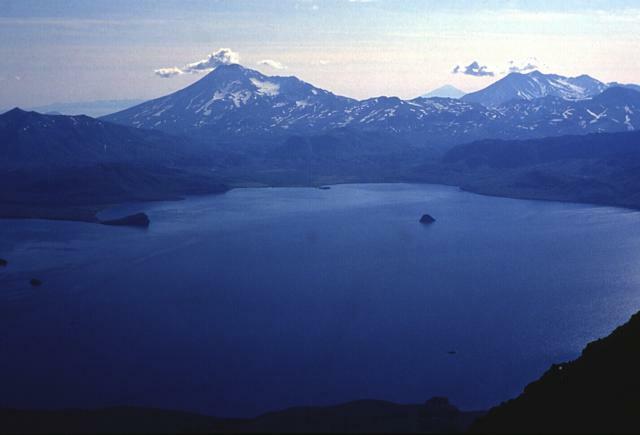 The compound stratovolcanoes of Kambalny (left) and Koshelev (right), rise beyond the SW shore of scenic Kurile Lake caldera at the southern tip of Kamchatka. Kurile Lake caldera formed in two stages, the first about 41,500 radiocarbon years ago and the second about 8000 years ago during one of Kamchatka's largest Holocene eruptions. The small island (right center) is the "Heart of Alaid," a rhyolitic lava dome. The conical peak on the distant horizon at right center is Alaid stratovolcano, the northernmost of the Kuril Islands. Photo by Nikolai Smelov, 1996 (courtesy of Vera Ponomareva, Inst. Volcanic Geology & Geochemistry, Petropavlovsk). 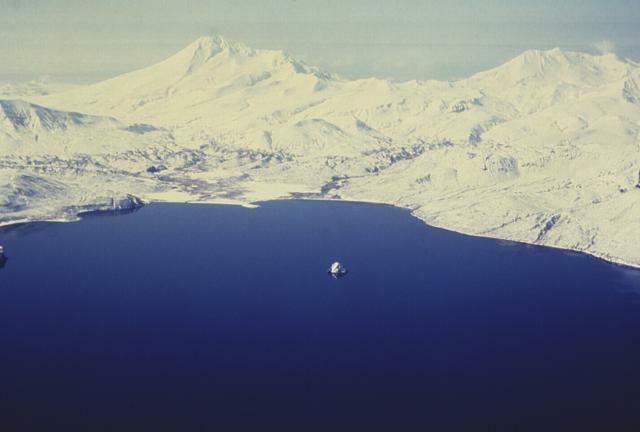 The elongated Koshelev stratovolcano (upper right), the southernmost historically active volcano on the Kamchatka Peninsula, rises SW of the Kurile Lake caldera. Koshelev is a complex group of four stratovolcanoes constructed along an E-W line over a Pleistocene shield volcano. The central and highest peak is the youngest. The only historical activity of Koshelev was an explosive eruption at the end of the 17th century. Alaid, the northernmost volcano of the Kuril Islands, is the conical peak on the left horizon. There are no samples for Koshelev in the Smithsonian's NMNH Department of Mineral Sciences Rock and Ore collection. Large Eruptions of Koshelev Information about large Quaternary eruptions (VEI >= 4) is cataloged in the Large Magnitude Explosive Volcanic Eruptions (LaMEVE) database of the Volcano Global Risk Identification and Analysis Project (VOGRIPA).